The skaters leap into the sky high above the traffic on Sunset Blvd, as people on their daily commute slow down and look, and then look again. These are not the usual skateboard images one see’s everyday in a big city like Los Angeles. They are female skateboarders, a rarity in magazines and never on billboards, which now make these female skaters larger than life on a busy intersection where they can’t go unnoticed. 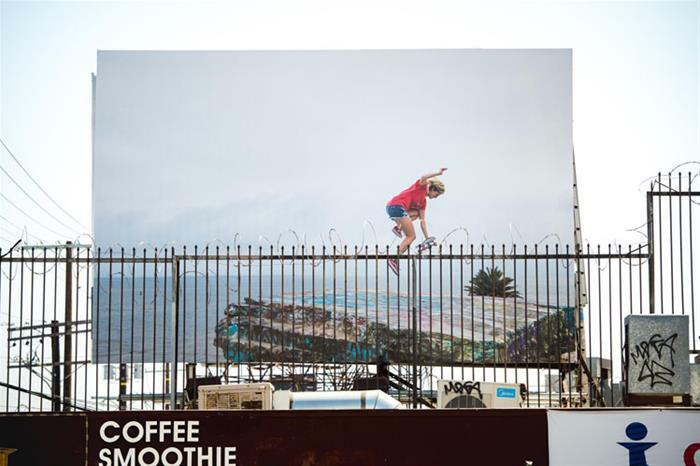 The photographic billboards on Sunset Boulevard combined with a limited photography edition was conceptualized and released by DISTINCT. 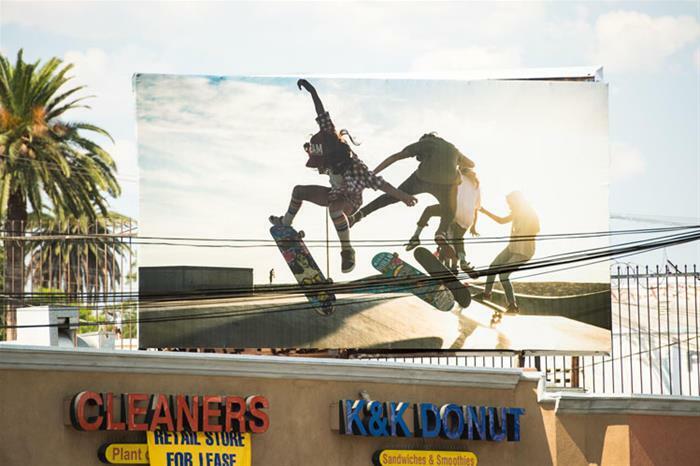 DISTINCT is presenting Ian Logan’s photography, featuring female skateboarders on two billboards located at 2101 Sunset Blvd. in the trendy, neighborhood of Echo Park. Based on a close collaboration between photographer Ian Logan and his wife, OG pro skateboarder Cindy Whitehead, who recently published the book entitled “It’s Not About Pretty: A Book About Radical Skater Girls,” (http://www.itsnotaboutpretty.com) a series of photographs authored by Logan, gives visibility to female skaters in a male dominated arena (http://www.ianloganphoto.com/it-s-not-about-pretty-book). Whitehead is also the founder of Girl is Not a 4 Letter Word (http://www.girlisnota4letterword.com), a platform invested in promoting women in the field of action sports. Logan is an award-winning photographer from the UK. They live and work in the South Bay. On the occasion of this public project, DISTINCT will release a limited edition of the photograph. The edition can be acquired by contacting: lfirstenberg@distinctdaily.com. Proceeds from the sale of the "Elise, Sunken City" print will create funding for Girl is NOT a 4 Letter Word's new micro grant program that helps fund female based photo and video projects involving girls in skateboarding. The purpose of the micro grants is to create visibility and change in the media related to girls in action sports. More info on the GN4LW micro grants http://www.girlisnota4letterword.com/p/gn4lw-micro- grants.htmmicro- grants.html. DISTINCT is a platform for supporting the next generation of artists and designers. https://distinctdaily.com.